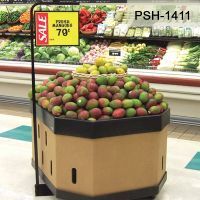 Floor Sign Holder and Banner Stands | Pallet Displays | Clip Strip Corp. 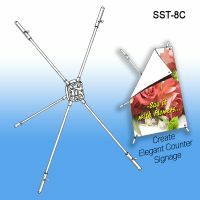 Floor banner and sign stands are are an effective way to communicate at retail, in businesses that service consumers such as supermarkets, banks, spa's, gyms, hotel lobby's, and at trade shows and events. The more durable versions are seen in the entrance ways or exits, and also throughout businesses wherever needed to communicate and change out messasges frequently. 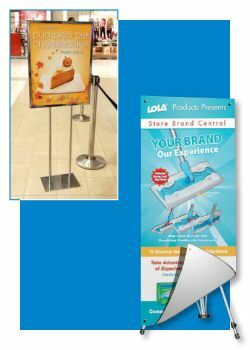 Our more permanent version of display stand sign holder banner stands are very durable and stand the test of time. Easily slip your sign into the top of the floor banner sign holders and exchange promotions in one quick and simple step. 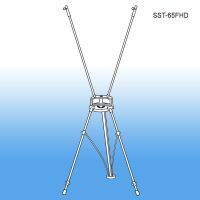 We also carry speed set banners that pop up easily where you attach a printed canvas type banner with grommets to 4 corners of the banner stand. These are usually used for more temporary reasons. Count on Clip Strip for all your Sign Holder needs! 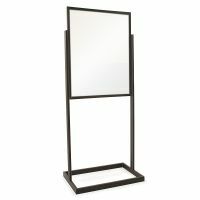 Minimum quantity for "Literature Basket for Poster Frame Display Stand, PP-2228BSKTC" is 1. 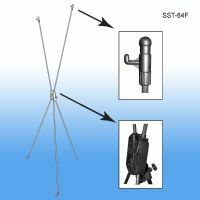 Minimum quantity for "Pallet Sign Holder, Adjustable Height, PSH-1411" is 1.